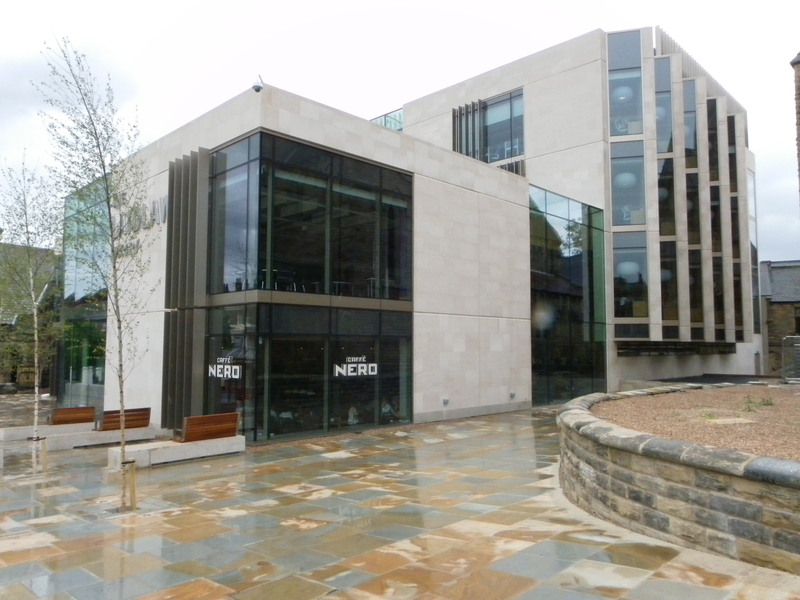 I have posted before about one new library, and if I were to write at length about the new Laidlaw library at the University of Leeds I would probably be making the same points. So I will notice the building only briefly before passing on to an allied matter. The library, designed for undergraduates, is in its way thoroughly contemporary: see the paving and the benches outside and the steel wires and vertiginously open staircase inside. But this is fused with a strong streak of old modernism: note the rectilinear shape and plate-glass windows. Its use of portland stone is intended to harmonise with the same material in the Parkinson building just up the hill, but in its polished surface the Laidlaw’s stone would remind you also of reinforced concrete. The frontage to Woodhouse Lane is of two stories, but further back – and up a slope – are two more. 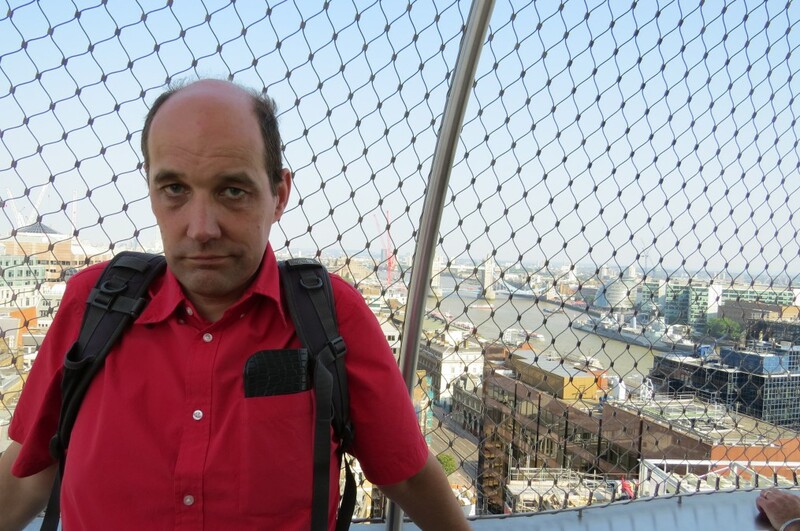 On the day of my visit a slide on a monitor suggested you might like to admire the view from the top floor windows, so in the rest of this post I shall do just that. 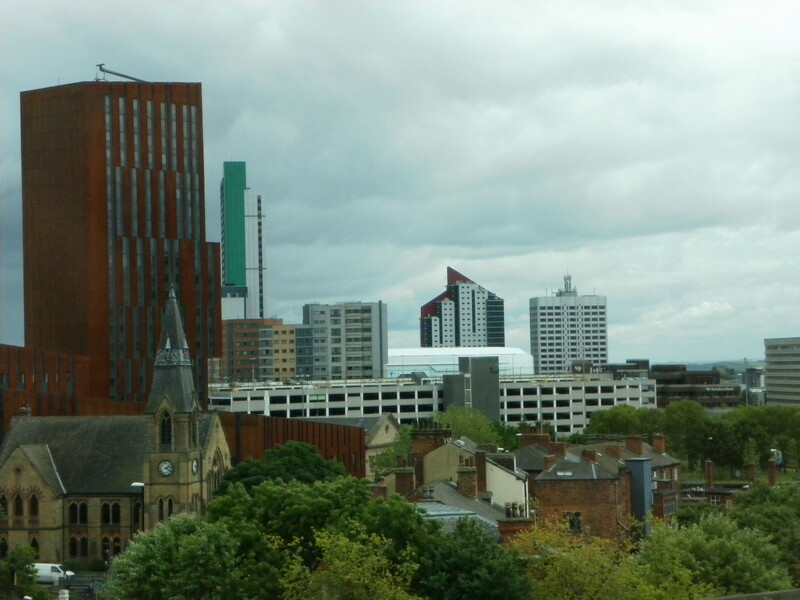 The view shows the changes that have come to the Leeds skyline but that skyline is still, after the 33 years I have known it, full of the essence of the city. The newer blocks, such as the rust-coloured slab of Broadcasting Tower (left), combine with an earlier modernism, such as the polished red granite of the Yorkshire Bank building (right background), and with the classical stone frontage of Old Broadcasting House (pedimented, centre), the churches, some still used for worship and some not, and the shiny red brick of the town houses and terraces which are perhaps what one associates most with Leeds. 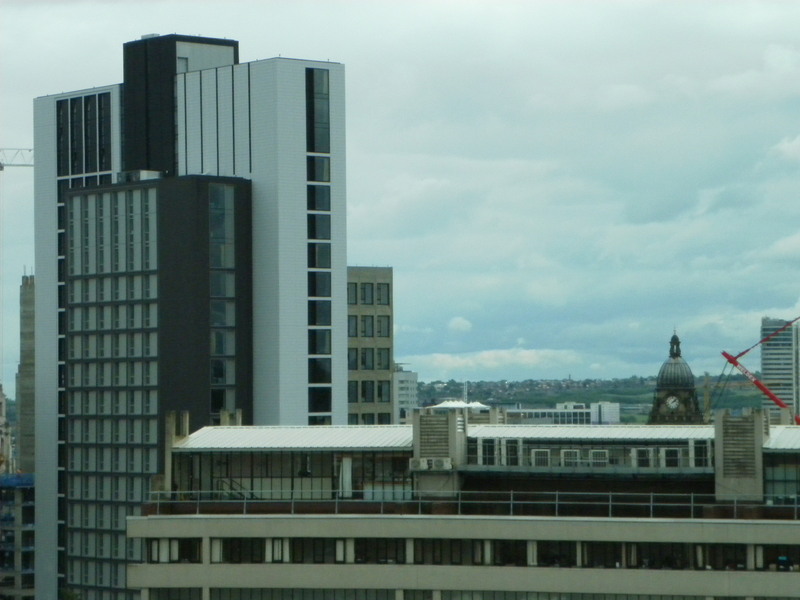 But what is perhaps the essence of Leeds is the way the buildings of the city of all ages combine in both views with a rough-surfaced green. Leeds has always fused the metropolitan and the bucolic: it remains easy to perceive the landscape on which the city was superimposed. Two place names from the north of Leeds embody this fusion. Scotland Wood is a wood. Ireland Wood is a housing estate, and has been for nearly seventy years. The combination of the green and the buildings was languorous on a warm afternoon. Within the scene there is a shimmer between past and present that brings us back to it again and again in search of its essence, like the elusive core of a poem that we constantly re-read. This entry was tagged Laidlaw Library, Leeds, townscape. Bookmark the permalink.